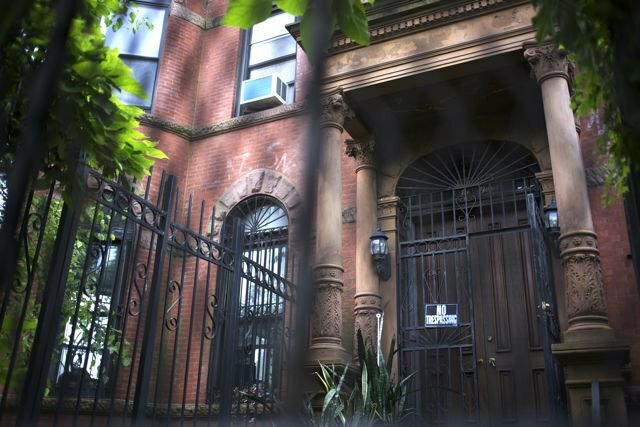 Who doesn't love the sight of the beautiful and very likely haunted Catherina Lipsius House, also known to Bushwick residents as The Spooky Mansion on Willoughby and Bushwick Aves? You'll be happy to hear that it shall stand even more proudly, with all its ghosts and creepy secrets, because it was named one of the city's new landmarks at a NYC Landmark Preservation Commission hearing yesterday. 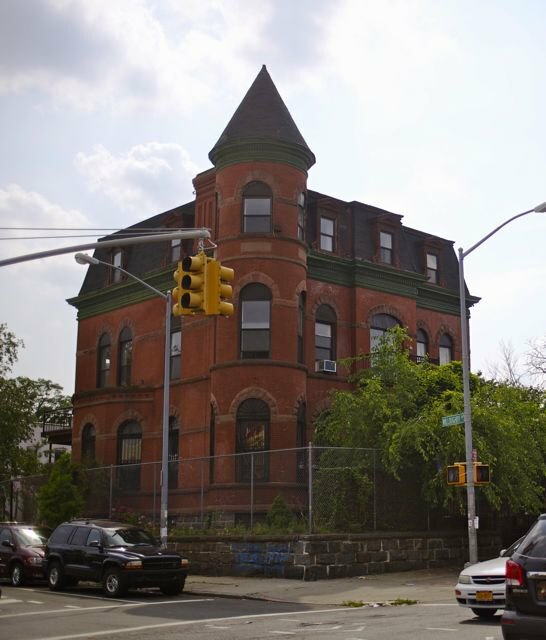 "Located at the corner of Willoughby Avenues, this 2 ½ story American Round Arch style mansion was commissioned by Catherina Lipsius, the owner of the Claus Lipsius Brewing Company, one of 35 that existed in Brooklyn by the 1880s. 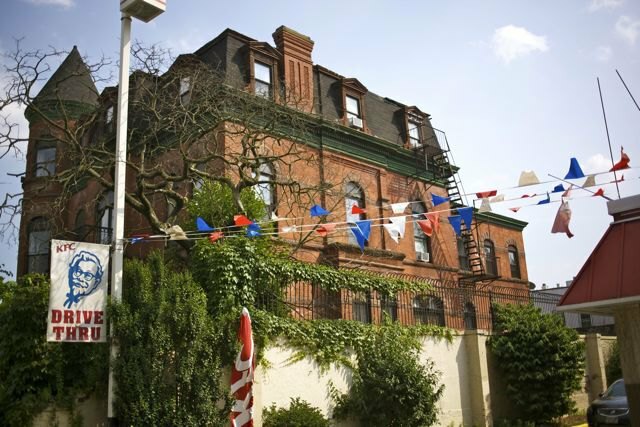 The mansion was completed in 1890, a time when Bushwick was home to a large German community, and Bushwick Avenue was named Brewer’s Row for the wealthy brewery owners who built their homes there. The red-brick building was designed by Theobald Engelhardt, a well-known and prolific Brooklyn architect and member of the German community who was responsible for many of east Brooklyn’s important residential, institutional, commercial and industrial buildings, including the ones that comprise the William Ulmer Brewery complex in Bushwick, a New York City landmark. The Lipsius mansion’s defining element is a dramatic rounded, three-story corner tower that’s crowned by a conical roof. A high mansard roof with pilaster dormers, embellished chimneys and delicate cornice detailing tops the main portion of the building. "This eye-catching house is a rare, unusually intact reminder of Bushwick’s days as the capital of Brooklyn’s thriving brewing industry in the last half of the 19th century,” said Chairman Tierney. The building was purchased in 1902 by Dr. Frederick A. Cook, a successful physician and Arctic explorer who claimed he was the first man to reach the summit of Alaska’s Mount McKinley in 1906. He later claimed he was the first man to reach North Pole in 1908, contradicting Robert Peary’s claim that he was the first, and triggering a widely publicized dispute. The house was sold to an Italian family in 1920, and acquired in 1952 by the Daughters of Wisdom, a Catholic religious order that used the building as a convent until 1960, when it was bought by a doctor who kept it until 1995. The current owners purchased the mansion in 1995." A property or object older than 30 years can become a landmark. Landmarks have "a special character or special historical or aesthetic interest or value as part of the development, heritage, or cultural characteristics of the city, state, or nation." How does the Spooky Mansion look like from inside? Check out the photo shoot with Lena Marquise we did two years ago at her apartment located there.